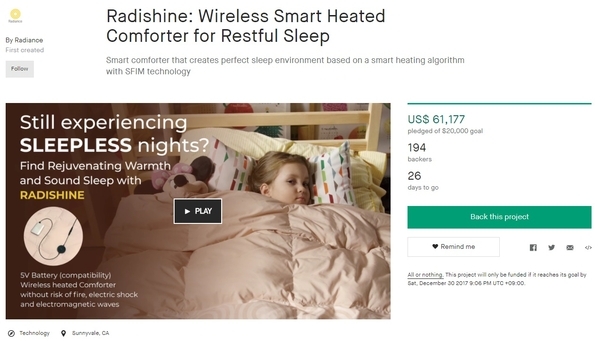 Radiance Co., Ltd have told that it has achieved its 100% goal amount in 1 hour 30 minutes of launch on last 20th at United States crowd funding platform ‘Kick Starter’ for their ‘Radishine-Wireless Smart heating Bedding’ product. ANYANG, KOREA, December 07, 2017 /24-7PressRelease/ — Radiance Co., Ltd have told that it has achieved its 100% goal amount in 1 hour 30 minutes of launch on last 20th at United States crowd funding platform ‘Kick Starter’ for their ‘Radishine-Wireless Smart heating Bedding’ product. On the basis of Dec. 4th, which is 14 days after the start of funding, it is showing steep upward trend by reaching approx. 310%, and over approx. 60,000 dollars as actual collection amount. For the global market competitiveness strengthening of ‘Radishine’ product, the Radiance’s crowd funding business has been progressed by receiving each field specialists customized consulting such as campaign planning, marketing, Beker(Sponsor) response by attending ‘Overseas investment inducement reinforcement of capacity program’ which is ‘Smart content hub activation support business’, hosted by National IT Industry Promotion Agency. Radishine is world’s first heating blanket that uses ‘Far-infrared ray’ technology, which is heating complex new material that enables superhigh speed heating within seconds. As a heating blanket, it has composed DV 5V battery pack to be used, which does not have electric shock hazard, fire or electromagnetic waves. Radishine enables left and right, up and down separate heating system, and heating by areas, which it is also mounted with deep sleep algorithm that helps the deep sleep of the user. 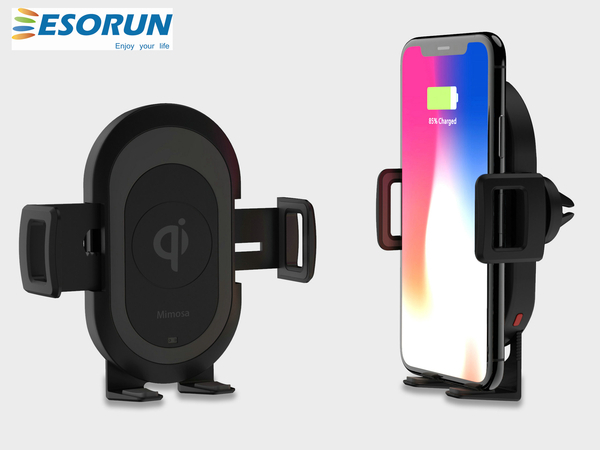 In addition, as a smart heating bedding product, this is a next generation product that can do on/off, temperature adjustment, user mode change of the blanket, by connecting to the smartphones using Bluetooth. Furthermore, Radiance Co., Ltd., is getting a lot of love from the consumers by launching ‘Far infrared rays mat’ which have supplemented the demerit of electric mat and hot water mat last year, and that interest is being continued in this year as well. The honest review like ‘I could have a deep sleep’ or ‘It will become a leader of hot water mat market’ of medical specialists about the use of Radishine mat is reducing the concerns of the consumers. The Kick Starter campaign for ‘Radishine’ product will continue until Dec. 30th (Sat), and more detailed contents could be checked through Kick Starter page and product landing page. NextInsight Global Named a Best Manager Company in U.S.
RT Technologies Wins Lasermet’s Distributor of the Year for the 2nd Consecutive Year!